When you find at a place with a name and location like this, you assume it has a rich history and many a story to tell. However, as typical with many things in New York City, a little investigation will reveal much more than you ever imagined. The New Yorker Hotel, 481 Eighth Avenue at 34th Street, clearly outdid my expectations. The exterior signage in the photograph looked much too new to be original to the structure - some reading confirmed my suspicions and led to some fascinating reading. Designed by Sugarman & Berger, the New Yorker opened in 1930. The building's art deco architectural style with tower set backs resembles the Empire State Building (which lies 3 blocks east and was completed in 1931). Names, dates and figures, the bane of many a history student, are often necessary to give a true feeling for a place. Many specifics are easily forgotten, but hopefully the impression remains that this was quite a place - the facts about this place are truly amazing. Of course it's central location in midtown is a big plus - walking distance from Port Authority Bus Terminal, Macy's, the Javitts Center with Penn Station across the street. The New Yorker hotel, a marvel of its day, was the largest hotel in New York with 2,500 rooms. In addition to the ballrooms there were ten private dining "salons" and five restaurants employing 35 master cooks. The barber shop was one of the largest in the world with 42 chairs and twenty manicurists. There were 92 telephone operators with 3200 phones and 150 laundry staff washing as many as 350,000 pieces daily. This was all supported by America's largest private power plant, which the New Yorker had installed down in the sub-basements. There was a ten-room hospital, a theater ticket office, a transportation department. Some of the rooms had private sky terraces or roof gardens. With the arrival of the Big Bands, the stage was set for the "heyday" of the New Yorker Hotel. The famous bands of the day played at the New Yorker, including Benny Goodman, both of the Dorsey's and Woody Herman. This atmosphere not only drew in business travelers and tourists, but also attracted the elite of society as well as political figures and business leaders. The Brooklyn Dodgers, with Manager Leo Durocher, headquartered here for the 1941 World Series, and Joe DiMaggio lived here when the Yankees were in town. The 1950's - 60's did not turn out to be as prosperous as previous years, and The New Yorker closed its doors in 1972. A less savory piece of history is its decline and closing in 1972 and purchase by Sun Myung Moon's Unification Church in 1975. The building was used by the church until 1994 when it reopened as a hotel (since 2000 it has been part of the Ramada franchise) and has gone through extensive renovations. It will maintain the classic Art Deco style but will see many upgrades to bring the hotel up to contemporary standards with amenities like flat panel, HD televisions and free Wi-Fi. *If you are not familiar with Tesla's life and work, I would highly recommend reading about this cult figure. Tomes have been written both off and online. Here is a good starting point. 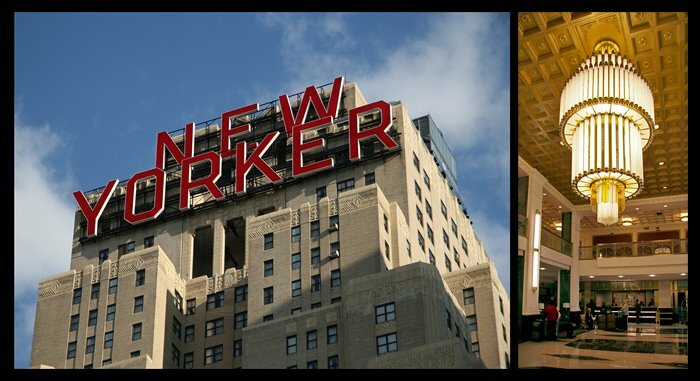 NOTE ABOUT THE PHOTO AND SIGN: The iconic, bright red “New Yorker” sign on the top of the hotel is part of the New York City skyline. Even though the New Yorker Hotel is currently undergoing a $65 million renovation, the red sign will remain a fixture of the New York City skyline, preserving the impressive view, far into the future. The sign was installed in 1941 and went dark in 1967. The new bright red sign is a six-story, LED banner and the largest of its kind in North America. It is also the highest off the ground for any LED sign as it is affixed to the top four floors of the New Yorker Hotel facing the West Side of New York. It can easily be seen from as far away as New Jersey as it stands out in midtown New York.